Globally insufficient physical activity has been identified to be the fourth leading risk factor for mortality, causing an estimated 3.2 million deaths worldwide . In high income countries (HICs) especially, high or increasing gross national product is often linked to low or decreasing physical activity levels  Physical inactivity is a key risk factor for non-communicable diseases such as cardiovascular diseases, cancers, chronic respiratory diseases and diabetes . Physical activity is defined as any bodily movement produced by skeletal muscles that requires energy expenditure . WHO recommends adults to do at least 150 minutes of moderate-intensity physical activity throughout the week . Compared to those who meet those criteria, people who are insufficiently physically active have a 20% to 30% increased risk of all-cause mortality . Speaking of HICs refers to the World Bank Country Groups. For the current 2017 fiscal year, high-income economies are those with a Gross National Income (GNI) per capita of $12,476 and more. Upper middle-income economies are those with a GNI per capita between $ 4,036 and $ 12,475, middle-income economies are those with a GNI per capita between $ 1,026 and $ 4,035 and low-income economies are defined as those with a GNI of $ 1,025 or less in 2015. . The Global Health Observatory is called the “WHO’s gateway to health-related statistics” . Its aim is to provide easy access to country data and statistics as well as WHO analyses to monitor global, regional and country situation plus trends. Global health priorities such as the health-related Millennium Development Goals are covered. .
For information on estimation methods visit this link. Worldwide in 2010, 23% of adults aged 18 years and older were insufficiently active (men 20% and women 27%). The highest prevalence of insufficient physical activity had the WHO Eastern Mediterranean Region (31%) and the Region of the Americas (32%). On the contrary, the prevalence was lowest in the South-East Asia (15%) and African (21%) regions. Across all regions, men were more active than women, with differences in prevalence between men and women of 10% and greater in the Region of the Americas and the Eastern Mediterranean Region. According to the level of income, the prevalence of insufficient physical activity rose so high income countries had more than double the prevalence compared to low-income countries for both men and women. In high-income countries, 41% of men and 48% of women were insufficiently physically active as compared to 18% of men and 21% of women in low-income countries. Among low-and middle-income countries, raised Human Development Index values were linked with decreased levels of physical inactivity The increased automatism of work and life in higher-income countries creates fewer opportunities for sufficient physical activity, whereas in low-and middle-income countries there is more work and transport related physical activity necessary for both men and women. For children and adolescents it is recommended to do at least 60 minutes of moderate- to vigorous intensity physical activity daily. Nevertheless, globally 81% of school going adolescents aged 11-17 years did not reach these WHO recommendations in 2010. School going adolescent girls were more passive than boys, with 84% of girls versus 78% of boys not meeting WHO goals. By far the lowest prevalence of insufficient physical activity (74%) showed adolescents from the WHO South-East Asia Region. Opposite in the Eastern Mediterranean Region, the African Region and the Western Pacific Region (88%, 85% and 85%, respectively) levels of insufficient physical activity were highest. In all WHO regions adolescent girls were less active than adolescent boys. Across income groups, there was no clear pattern of insufficient physical activity among school-going adolescents. Thus the prevalence of insufficient physical activity was highest in upper-middle-income and lowest in lower-middle-income countries. Strong evidence shows physical inactivity increasing the risk of several major non-communicable diseases. It is estimated that worldwide physical inactivity causes 6% of the burden of disease from coronary heart disease, 7% of type 2 diabetes, 10% of breast cancer and 10% of colon cancer respectively. In total, inactivity would cause 9% of premature mortality globally. . Insufficient physical activity is partly due to sedentary behaviour on the job and at home as well as inaction during leisure time. Similarly, an increase in the use of "passive" modes of transportation also contributes to the drop in physical activity.. Regarding environmental factors, urbanisation and the following factors can discourage people from becoming more active . As physical inactivity is associated with this wide range of chronic diseases it also provokes an economic problem. Conservatively estimated, physical inactivity cost health-care systems globally $53.8 billion worldwide in 2013. Of this sum, $31.2 billion was paid by the public sector, $12.9 billion by the private sector and $9.7 billion by households. Further, physical inactivity caused 13.4 million DALYs (disability-adjusted life years) internationally, and physical inactivity related deaths lead to $13.7 billion of productivity losses. Especially high-income countries bear a larger proportion of economic burden with 80.8% of health-care costs and 60.4% of indirect costs, whereas LMICs have a larger proportion of the disease burden with 75% of DALYs..
To increase physical activity levels globally population-based, multi-sectoral, multi-disciplinary, and culturally relevant policies need to be implemented. The WHO Member States have agreed on a voluntary global target for a reduction of 10% in physical inactivity by 2025. . It is one of nine targets in the global action plan to reduce non-communicable diseases and improve mental health..
With the programme “Good, Better, Best” Copenhagen is working to further improve its world leading cycling system as the City aimed to reach the goal to become the world’s best bicycle city before the end of 2015 . The bicycle is the most used form of transport with an average share of 36% for trips to work or educational institutions. Yearly health benefits of cycling in Copenhagen are 228 000 000€. Due to the fact that the citizens of the region are such diligent cyclists, the City of Copenhagen estimates that it has one million fewer sick days. Particularly among Arabic adults living in Middle Eastern countries low levels of physical activity were found (WHO, 2014). For instance, in Qatar the prevalence of physical activity among adult men is 63% while it is only 43% among women. When developing strategies to promote healthy lifestyle individual resources and barriers have to be considered for a successful programme implementation . Factors that impede physical activity in Arabian countries occur at different levels: not only on the individual level (e.g. health status, lack of time) but also on the cultural/social/policy level (e.g. especially for women and their traditional roles, lack of social support or use of housemaids) and the environmental level (e.g. lack of exercise facilities, hot temperatures). Factors that promote physical activity were: muslim religion, wish to have well-trained bodies, and having a good social network. Since 2012, the second Tuesday of February of each year, a national Sports Day takes place, when every citizen of Qatar is encouraged to participate in sporting activities with family and colleagues. It aims to promote sports and to educate how to increase physical activity to reduce health risks.Hundreds of activities and sport day events are organized by many government ministries and private sector companies such as Qatar Olympic Committee. Countless free sporting sessions and competitions are available for all, which is why the day is also viewed as an opportunity to bring communities closer together. As a reminder of Qatar’s ancient sporting heritage and culture, National Sport Day also focuses traditional Al Shawahef rowing championships. By declaring this national holiday living an active lifestyle has been clearly communicated and supported by the Qatarian government . ↑ Atkinson K, Lowe S, Moore S. Human development, occupational structure and physical inactivity among 47 low and middle income countries. Preventive Medicine Reports 2015; 4: 40-5. ↑ WHO, 2014. Age-standardized prevalence of insufficient physical activity in adults. ↑ Lee IM, Shiroma EJ, Lobelo F, Puska P, Blair SN, Katzmarzyk PT, Lancet Physical Activity Series Working Group. Effect of physical inactivity on major non-communicable diseases worldwide: an analysis of burden of disease and life expectancy. The lancet. 2012 Jul 27;380(9838):219-29. ↑ 13.0 13.1 Ding D, Lawson KD, Kolbe-Alexander TL, Finkelstein EA, Katzmarzyk PT, Van Mechelen W, Pratt M, Lancet Physical Activity Series 2 Executive Committee. 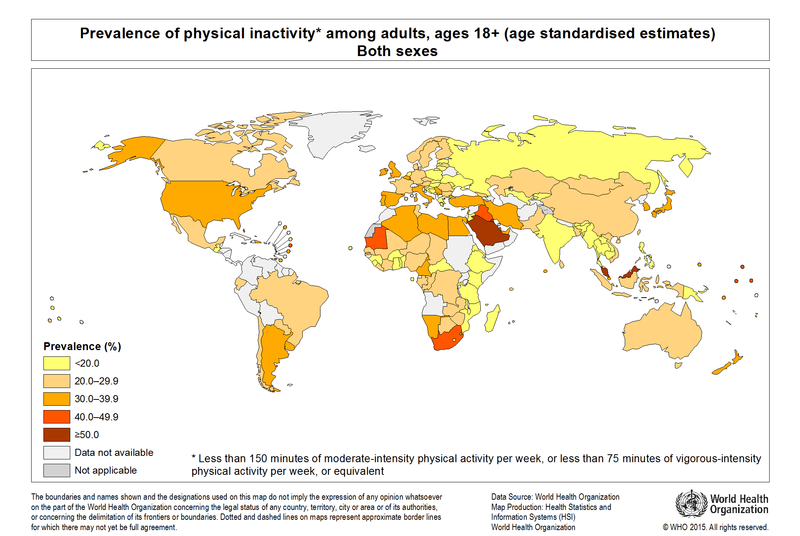 The economic burden of physical inactivity: a global analysis of major non-communicable diseases. The Lancet. 2016 Sep 24;388(10051):1311-24. ↑ Heath GW, Parra DC, Sarmiento OL, Andersen LB, Owen N, Goenka S, Montes F, Brownson RC, Lancet Physical Activity Series Working Group. Evidence-based intervention in physical activity: lessons from around the world. The lancet. 2012 Jul 21;380(9838):272-81. ↑ Hallal PC, Andersen LB, Bull FC, Guthold R, Haskell W, Ekelund U, Lancet Physical Activity Series Working Group. 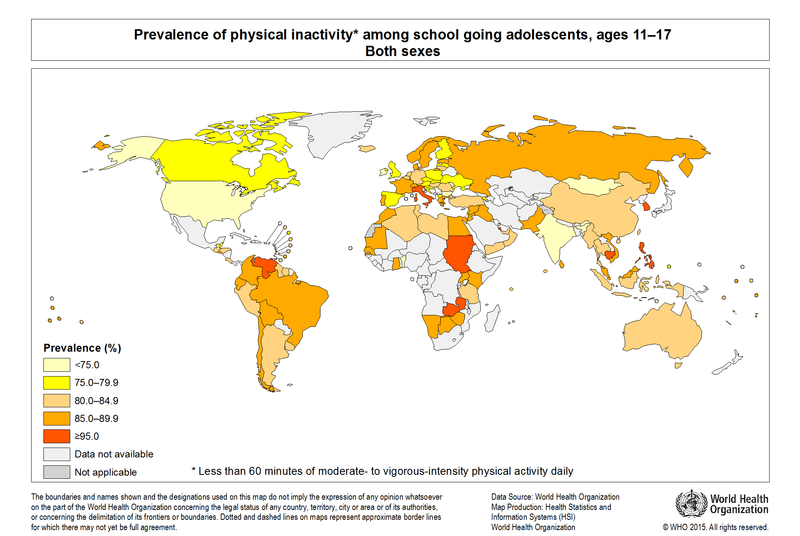 Global physical activity levels: surveillance progress, pitfalls, and prospects. The lancet. 2012 Jul 21;380(9838):247-57. ↑ The City of Copenhagen. Good, Better, Best. The City of Copenhagen’s Bicycle Strategy 2011-2025. 2011.